Crossovers are exploding onto the market right now, and the Kia Sportage is making a name for itself as a versatile, competitive option. 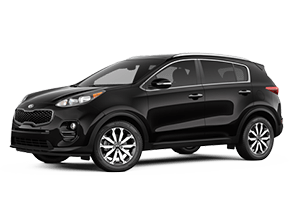 With fun coloring inside and out, comfortable materials and design, and tons of upgradeable features, the Sportage is about as customizable as they come. It comes standard with features such as LED Daytime Running Lights, rearview camera, Bluetooth® connectivity, a rear spoiler, and seven exterior color options. 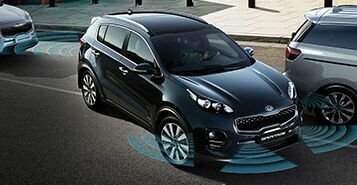 The Sportage has available all-wheel-drive on all trim levels, and a six-speed automatic transmission with Sportmatic®. There are many technology and convenience upgrades available on the Sportage as well, such as a voice-command navigation system, a sport steering wheel, and heated front seats. The Sportage also has plenty of space with a 60/40 split-folding rear seat, allowing you up to 60.1 cubic-feet of cargo space. 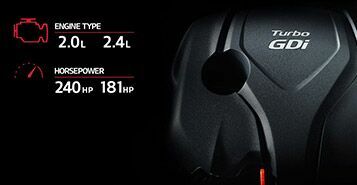 Choose from a 2.4-liter engine with 181 horsepower or a 2-liter turbocharged engine with 237 horsepower for a fun, exhilarating ride. Efficiency is not sacrificed for this power though; the Sportage gets up to 23 city and 30 highway MPG. Driver assistance technologies help keep you on track and moving forward to your destination. Blind Spot Detection alerts you to vehicles you may not be able to see, Lane Departure Warning System and Lane Change Assist help you stay in your lane or change lanes safely, and Parking Assist helps with parallel parking using front and rear sensors. Kia’s UVO eServices allow you to stay connected with hands-free calling and navigation, music, roadside assistance, and more. 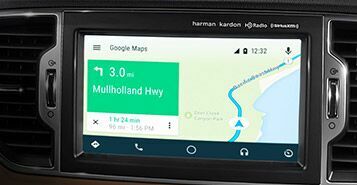 Apple CarPlay(™) and Android Auto(™) are compatible with this system as are apps such as Pandora® and Yelp©.